Featuring baroque, gothic, Renaissance and neoclassical buildings, the square allows for quick access to St. Michael's Church and the Banffy Palace. 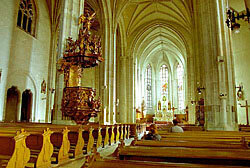 Flanking the church on the south side is a 1902 equestrian statue of the 15-th century ruler, Matei Corvin. In the southwest corner of the square stands Hotel Continental, built in 1895 in an eclectic style combining Renaissance, classical and baroque elements. 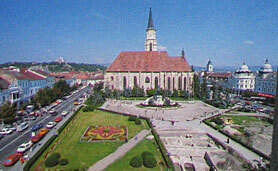 During World War II, the hotel served as the German military headquarters in Transylvania. Across the square, you can visit the Hintz House, which served as Cluj's first and longest-running pharmacy (1573-1949) and is now home to the Pharmacy Museum More info.. Dating from 1475, Tailors' Bastion is one of the two structures, that were once part of the old fortified town, still standing. (The Firemen's Tower is the other defending tower that has survived for more than fivecenturies. Open: daily 7 a.m. - 7 p.m.
Wed. - Sun. : 10 a.m. -- 5 p.m. Housed in the most representative Transylvania baroque buildings: the Banffy Palace, Cluj Art Museum displays sculptures, graphics, weapons, furniture, carpets, and paintings by Romanian artists such as Nicolae Grigorescu (1838-1907), Theodor Aman (1831-1891) and Theodor Pallady (1871-1956). Both Grigorescu and Aman were influenced by the Barbizon group and the Impressionists, while Pallady spent many years in Paris and drew inspiration from Matisse. The Emil Racovita Speleology Museum is the only one of its kind in Romania. The museum displays a fascinating collection of over 50,000 species of subterranean fauna gathered by Romanian biologist, Emila Racovita (1868-1947), the founder of world's Speleology Institute, in 1920. Here, you can admire some of the discoveries made by Racovita in the over 1,200 caves he explored in Europe and Africa. Emil Racovita is also the author of an original theory of biological evolution. Open: Wed. - Sun. 10 a.m. -- 6 p.m.
Endowed with a collection of more than 65,000 ethnographic items, the museum offers an excellent introduction to Transylvanian folk art and traditions. 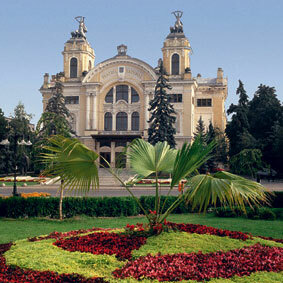 Founded in 1922, it is one of the most important ethnographic museums in Romania. Tue. : - Sun. 10 a.m. -- 4 p.m. Thu. : noon - 6 p.m. The museum is also open on the last Saturday of each month and closed the following Monday. 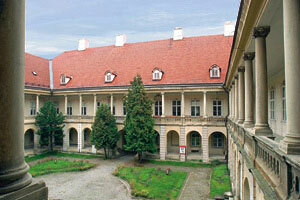 is located on the site of Cluj-Napoca's first pharmacy (open in 1573). Open: Mon. - Sun. 8 a.m. - 8 p.m.
Wed. - Sun. 10 a.m. - 6 p.m. (April through September). Wed. - Sun. 9 a.m. - 4 p.m. (October through March). Hoia - Baciu is a forested area ideal for nature walks and relaxation. Alleged varied paranormal phenomena occur frequently in the woods. Hoia Baciu Haunted Woods tours and more information. A unique village known for the beautiful traditional costumes worn by the locals, the colorful Tuesday Market, the Dance House / Museum and the nearby marsh walk paths. Cluj makes a great base for exploring the stunning Apuseni mountain range, located southwest of the city. The Apuseni Nature Park protects one of the most interesting cave systems in the country. Limestone underlies most of the park and is responsible for the area's impressive landforms and more then 400 caves, many of which can be explored. Sculptured mountain ridges, mysterious underground rivers and delicate cave formations will keep your camera busy. 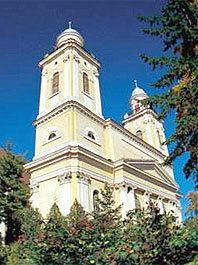 Rent a car in Cluj and take the scenic drive to Campeni. Explore Scarisoara Cave, a national monument and home to the second largest underground glacier in Europe. 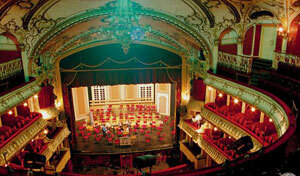 The Philharmonic Concert Hall in Cluj is the main music venue in Transylvania - Central Romania. the Chamber Orchestra, the Transilvan Quartet and the Folk Music Orchestra. Tour starts: Piata Unirii, in front of Matthias Corvinus statue. The airport is located 6 miles east of the city centre. Taxis are the quickest way to get from the airport to Cluj downtown. Bus number # 8 departs every 15 minutes from the airport to Piata Mihai Viteazul - City Center. (duration of the ride is approx. 30 minutes). as well as to/ from Belgium, Cyprus, France, Germany, Great Britain, Greece and Ireland. as well as to other Central and Western Europe cities (connectiom in Budapest). Timisoara (journey time: 5 hours). Mon. - Fri.: 8 a.m. to 8 p.m.
Cluj Napoca SNCFR ticket office offers train information and tickets for future travel. numerous bus (autobuz), tram (tramvai) and trolleybus (troilebuz) routes. The city's public transportation system is safe and reliable. All Cluj public transportation routes are operated on regular schedule Mon. through Fri., from 5 a.m. to 11 p.m.
Tickets are inexpensive (the equivalent of $0.50 / trip) and are valid for bus, tram or trolleybus. or check our Accommodations guide. Mon. - Fri.: 8 a.m. - 7 p.m.